Aspergerâ€™s has certainly not been a hindrance to Yuliâ€™s capability as an artist, and inÂ fact we believe it gives him a unique sense of creativity, allowing him to be takenÂ seriously as a professional artist. His ability to recast classic mythologies with aÂ seamless mix of more contemporary icons is testament to this, as seen in the body of work that will be showcased in this exhibition. Mythologies is Yuli’s second solo exhibition, and focuses on an area that greatly interests this young artists – myths and legends. While most of the icons are culled from the artists deep interest in the area, he manages to incorporate imagery from more modern sources as well, particularly from the Japanese mangaÂ art genre, motoring and skateboard street cultures, areas which also interests Yuli greatly. 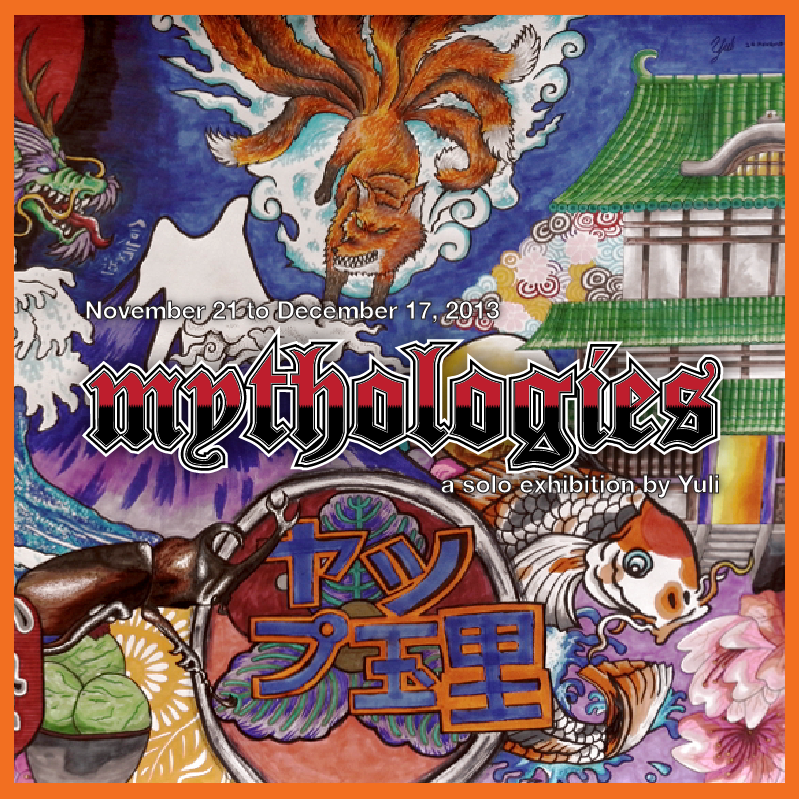 MythologiesÂ will start on Thursday, November 21 and continues its run until December 17, 2013. The exhibition will officially open at 3pm on Sunday, November 24, 2013, by Yang Berbahagia Puan Sri Annette Bashir, who has graciously agreed to be the guest of honor. Yuli was one of the seven artists we featured in last yearâ€™s Pieces of Joy, featuring the art of children and young adults with learning difficulties, in which 100% of his pieces were sold. His works stood out as being much more mature and unique, and we recognized even then the need for a more focused showcase of his art works. We are truly honored, therefore, to be able to continue playing a role in his artistic journey with Mythologies, Yuliâ€™s second solo exhibition. All the works featured were created in 2012, specifically with this exhibition in mind. At Artemis Art, we continue our efforts to provide support for artists of all ages with the challenges of learning difficulties, be it Autism, Down Syndrome, or ADHD, to name a few. It is our way of helping these artists reach out to the kind and caring public, to demonstrate that despite their specific predicament, their artistic works speak for themselves. Art is, after all, a universal language to communicate oneâ€™s vision, hopes and desires. The positivity shown by artists such as Yuli continually becomes an inspiration to us. Their art becomes a channel enabling us to better understand them, taking us on a journey of many hues and many stories. It is a beautiful, non-judgmental journey, allowing us insights to better understand how they see the world, through the vivid and imaginative expressions displayed in their works. We congratulate the artist on his second solo exhibition, and we hope that you can join us on this fantastic visual journey into the wonderously vibrant world of Yuli’s art. We’re certain, too, that there will be many more such journeys in the years to come.